Venue: Aviva Stadium, Dublin Date: Saturday, 14 February Kick-off: 17:00 GMT Coverage: Live on BBC TV, HD, Red Button, Radio 5 live, Radio Ulster FM, BBC Sport website, mobile, BBC Sport app & Connected TV. At one of Joe Schmidt's first training sessions with Ireland, he let it be known there was too much rubbish lying around the place. Schmidt used to be a teacher, but skipper Paul O'Connell was not placed on litter duty. Such forensic attention to detail from a coach can cause disgruntlement among experienced pros. A bit of rubbish lying around the place never did me any harm, O'Connell could have been forgiven for thinking. But you'll struggle to find anyone with a bad word to say about Schmidt, the New Zealander who led Ireland to a Six Nations title at the first attempt last year. Rugby players crave simplicity and Schmidt has that rare gift: the ability to translate forensic discoveries into understandable lessons. "Joe is an excellent strategist and a brilliant communicator," says O'Connell, who will lead Ireland against France on Saturday after a stuttering opening win over Italy in Rome. "You learn something new every training session. He is able to simplify things and get players into the right places where they can use their skill-set." Brian O'Driscoll won two Heineken Cups under Schmidt with Leinster as well as a second Six Nations crown in his final campaign. The recently-retired Ireland legend played under some smart coaches but says Schmidt was the smartest of the lot. It's a long way from coaching kids in the backwoods of Ireland to coaching elite pros. So you'd think. But Schmidt readily admits his time at Wilson's Hospital School in Multyfarnham, an hour or so west of Dublin in County Westmeath, influenced his current philosophy and techniques. "Coaches are like magpies, they take little shiny bits from wherever they've been and keep adding to the nest," says Schmidt, who arrived at Wilson's Hospital in the early 1990s and turned around the fortunes of Westmeath's oldest school, leading the perennial underachievers to a provincial cup triumph in 1991. "One of the advantages of being able to coach at that level is that you can experiment, because there is no expectation. I've no doubt some of the things I believe in now come from the time I spent in Westmeath." Mick Finnegan, who still teaches and coaches rugby at Wilson's Hospital, remembers Schmidt as an infectiously obsessive coach who revolutionised the way rugby was taught, both at the school and at nearby Mullingar RFC, for whom Schmidt also played at weekends. "We were dinosaurs back then," says Finnegan. "Before Joe's arrival, we played 10-man rugby, the way country rugby had always been played in Ireland. "But Joe threw himself into his coaching completely. He also brought a level of professionalism over from New Zealand, a level of organisation, intelligence and individual responsibility. He was very good at making individual players better, or at least better contributors to the team." Compare Finnegan's observations from 23 years ago to those of Brad Thorn, the cross-code legend who won a Heineken Cup under Schmidt with Leinster in 2012. "Joe is very passionate, very high-intensity and dedicates an awful lot of time to his job," says 40-year-old Thorn, a former Australia rugby league international who won the 2011 World Cup with the All Blacks, is now at Leicester and has played under some of the finest rugby coaches of the modern era. "He's excellent with detail, everyone knows what they're supposed to be doing in his teams. We'd have some solid meetings that would go on for a good hour or so. He'd go into his schoolteacher mode. But you got the sense he was a good schoolteacher, because he was very good at communicating to large groups." A good coach isn't necessarily a popular coach, and vice versa. 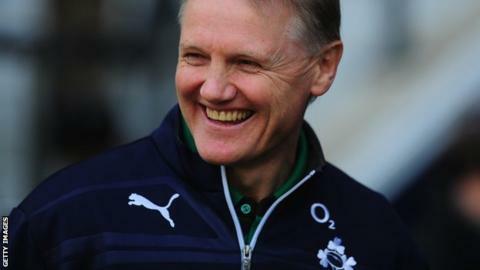 But from his days in Westmeath to his current post with Ireland, Schmidt has managed to garner results from his players, while earning both their respect and goodwill, through a combination of integrity, intelligence and soft communication skills. Freddie Butler formed a useful half-back partnership with Schmidt at Mullingar RFC and still coaches at the club. Butler says that within a week of joining up, Schmidt knew the names of all 50-60 players turning out for training - although some players reacted better to Schmidt's forward-thinking methods than others. "I'd hate to be his wife, because rugby meant everything to him," says Butler. "Then again, Kellie slotted in perfectly because she knew more about rugby than a lot of the characters on the sidelines. "Under Joe, there was no going out the night before a game. That went for the second and third XVs as well as the firsts. He didn't always succeed but because he had such enthusiasm, players couldn't help but try to meet him at least halfway. He didn't hold an iron fist over his teams, people just responded." And here's Thorn again, revealing that little has changed since: "Joe has high standards but is able to tell people what they need to know without making it feel like a personal attack. When some coaches critique you, it sounds like they're putting the boot in and you leave the room hating them as a person. "I sat down with him after the Heineken Cup final in 2012 and told him how impressed I was with him, both as a coach and a bloke. And whenever people ask me about him, I always talk him up, big time." They all talk Schmidt up - old friends from Woodville, the small North Island town where he grew up; team-mates at Manawatu, for whom he played club rugby in the 1980s; fellow teachers at various New Zealand schools; players and colleagues at Bay of Plenty, Auckland Blues and French club Clermont Auvergne. Because wherever Schmidt has been he seems to have made a difference. Before Schmidt's arrival, Bay of Plenty had never won the Ranfurly Shield, New Zealand's oldest competition, in almost 100 years of trying. They won it in 2004, Schmidt's only season at the club. In 2010, with Schmidt assistant to current Scotland coach Vern Cotter, Clermont won the French league for the first time, having been runners-up 10 times. With Leinster, he won the Heineken Cup in his first two seasons in charge. The year before he joined Ireland they had suffered their worst finish in the Six Nations for 14 years. They won it in his first year at the helm, went on to beat Australia and South Africa last autumn and are among the favourites to win the Six Nations again. Former Wasps and England fly-half Alex King was an assistant coach alongside Schmidt at Clermont between 2007 and 2010. He believes Schmidt's various successes prove that "good guys can still come out on top". "Joe was just one of those coaches players wanted to play for," says King, now a coach at Northampton. "He put the work in off the field, making himself fluent in French, which was one of the reasons the guys took to him so readily. "And Joe's got good values, that's his greatest quality. He's constant, so you know exactly where you stand with him and what he expects of you. He's a top bloke, a real laugh who likes the occasional Guinness and has an amazing wife and four kids. Joe shows that you don't have to be a bully to get results." At present, Schmidt has Saturday's game against France in Dublin weighing heavily on his mind. But mention Multyfarnham and his broad grin will tell you everything you need to know: they are still his people, his colleagues, his players, every bit as much as those he has around him with Ireland. "I bumped into him on a plane just after he got the Leinster job and I was complaining about the attitude of some of the young lads at Mullingar," says Butler. "He compared it to his own situation at Clermont, told me that a coach's job is not just about teaching rugby but also trying to get inside a player's head. "He's an extremely impressive man and very humble, even though he's the Ireland coach now. He still comes to visit on a regular basis, stays with old friends, has a drink in the local pub, never forgets a face and has time for everybody. We're very proud of the connection we have with him." The stone has rolled an awful long way from Woodville to Dublin. But, in defiance of the proverb, it has never stopped gathering moss.